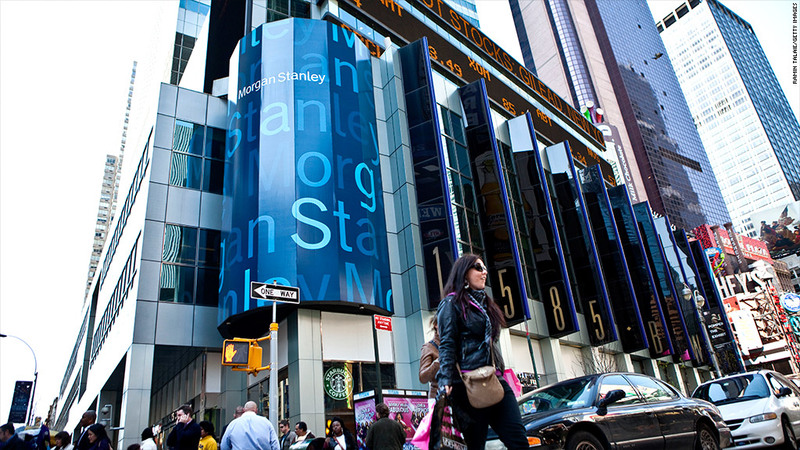 Morgan Stanley is one of 9 major banks charged with selling bad mortgages to credit unions. The federal regulator that oversees credit unions has filed suits against eight of the nation's largest banks, charging they sold faulty mortgages to two credit unions that later failed. The suits charge that Morgan Stanley (MS), Barclays (BCS), JPMorgan Chase (JPM), Credit Suisse (CS), Royal Bank of Scotland (RBS) and UBS (UBS) sold the bad mortgages to Southwest and Members United corporate credit unions, while Goldman Sachs (GS), the Wachovia unit of Wells Fargo (WFC) and a unit of what is now Ally Financial sold mortgages to just Southwest. JPMorgan is being sued because of mortgages sold by Bear Stearns, which was bought by the bank in 2008. The suits from the National Credit Union Administration say that Morgan Stanley was the major seller of the bad mortgages to the credit unions, selling more than $416 million in mortgage-backed securities. The other seven banks sold more than $1.9 billion in mortgage securities between them. The suits allege the banks made misrepresentations in connection with the underwriting and subsequent sale of the mortgage-backed securities. Representatives of the banks either were not available for comment about the suits early Tuesday or did not have a comment. Southwest and Members United were corporate credit unions, which functioned as wholesale credit unions providing such services to retail credit unions as check clearing, electronic payments and investments. In all, five corporate credit unions failed due to the meltdown in the market for mortgage securities after the housing bust. The NCUA has already recovered $335 million from earlier suits against Citigroup (C), Deutsche Bank (DB), HSBC (HBC) and Bank of America (BAC). The funds it recovers go into the Temporary Corporate Credit Union Stabilization Fund, an insurance fund that protects the funds of customers of credit unions when they fail. The fund gets its assets from assessments against all federally insured credit unions, so any recoveries would help reduce future assessments on credit unions.